My first day of the 44th Annual Seattle International Film Festival was a varied and long, starting with a Secret Festival screening at the Egyptian Theater (that’s all I can say about that) and traveling through time, from feudal Japan to 1960s France. I didn’t know anything about Sansho the Bailiff (1954) going into the film, except that director Kenji Mizoguchi is among the most celebrated Japanese filmmakers. I looked forward to seeing a restored version of the film for my first viewing and I was not disappointed. It sounded great and the mistily beautiful cinematography was presented to great effect. 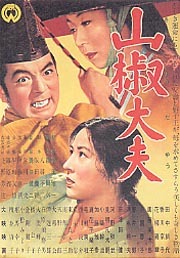 Sansho is the story of a wealthy family who are separated when their governor father is exiled. They each fall into misfortune, primarily due to the heartless actions of the titular Sansho, whose trade is human bodies and the labor and pleasures they offer. Imprisoned and abused, all these unfortunate souls possess is the strength to stay true to their beliefs, though even that is not always assured. Mizoguchi had a talent for finding the right people and setting them free on his productions. The wisdom of this approach is most evident in the achingly elegant, long shots of cinematographer Kazuo Miyagawa, and the simultaneously enchanting and menacing music score composed by Fumio Hayasaka, Kinshichi Kodera, and Tamekichi Mochizuki. These beautifully composed elements give the film a grace that does nothing to diminish the horrors on display, but does give the viewer the strength to absorb it all. You do need strength to watch this film too, because it isn’t out to bring villains to justice, but rather to bring their evil deeds into the light. No resolution is offered, but in the end, everything lands in a place of love and forgiveness which can only come from the pursuit of integrity. Godard Mon Amour (2017) is the lighter, vaguely slapstick story of film director Jean Luc-Godard in the period after he had made the revolutionary Maoist flick La Chinoise (1967) and married its young star, Anne Wiazemsky. The film passes through the decade plus they spend together. In this time Godard is faced with fans who want him to “be funny again” and engage him in conversations with no purpose or end. The director struggles to find acceptance for his new work, a film about revolution, while he tangles with what it means to be a revolutionary in the first place. This exploration takes place in public, in the midst of protests and rooms of passionate youths who are always pained and outraged when Godard takes the mike and tries to work out what he means to say in real time. He realizes he is aging out of being an angry young man and that his youthful wife will not turn the clock back for him. 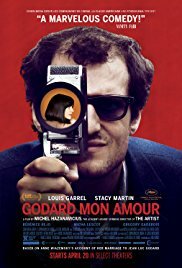 As Godard, Louis Garrel captures some of the edgy, itchy restlessness of the filmmaker in a mostly comic performance in which he is shown to be out of sync when it comes to interacting with the world, a fact emphasized with a running gag in which his glasses are constantly broken. Rather than exude the pouty reproachful look of Wiazemsky, Stacy Martin has the appearance, and passive air of Chantal Goya in Godard’s 1966 film Masculine Feminine. Because of this, I was never able to accept that the woman on the screen was meant to be the same person as that budding revolutionary in La Chinoise. The real Wiazemsky appears more passionate and intelligent than this blank-faced, if strong-willed waif. There are laughs and insight enough for Godard aficionados in Godard Mon Amour. Fans of director Michel Hazanavicius will likely not get the same charge here as with The Artist (2011) or the OSS:117 films, though at times there is similar humor at play. Overall, it gives you the feeling that you are passing time with these characters without ever understanding much about them but that they existed. The film plays SIFF again at the Majestic Bay Theater on Tuesday, 5/22 at 9PM.